It is supposed to be winter... right? It seems like you would never be able to tell with these beautiful, warm and sunny days we have been having. But who are we to complain? What a great excuse to get outside and plant up those gardens. There are many benefits to planting succulents in the garden at this time of year; the most important being that your plants will have time to acclimatise to their new environment before Summer rears its ugly head. Make sure your soil is well draining, as succulents don't like to have wet feet. Add some coarse grain sand to help improve its draining ability. If your soil is clay, add some gypsum along with coarse grain sand. Plan your arrangement - Plant in rows to create a border, or plant in a group to create a mass effect. Create a feature of a taller species and plant lower growing varieties around or in front of it. Mulching your garden is a great way to keep the soil warm during Winter and cool during Summer. Pebbles, wood chips and gravel all make excellent mulches - just be sure to keep the mulch away from the base of your plant, as this can cause rotting. To assist in your mass planting project we have reduced the cost of our Season Mix of 50. 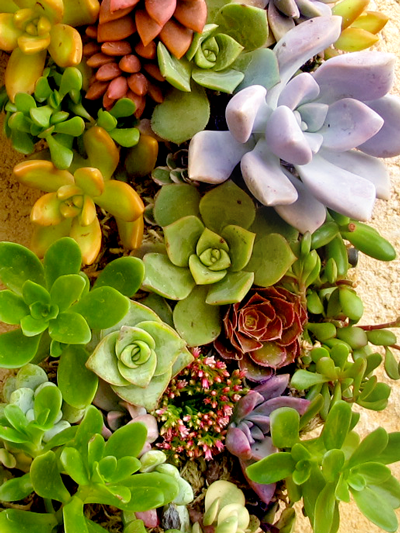 This selection includes 50 succulents chosen from our collection. There will be at least 20 different species in the selection and they will all come in 50mm pots. For two weeks only, our seasonal mix of 50 is only $160. Regular Price $175. This comes with free postage and can be shipped to anywhere within WA. Online orders only. Sale ends 13th July. Order Now!